For the 3rd and the final day, i made some delicous handvo using the handvo flour vaishali sent me. So, for the past 3 days it has been Gujju dishes for our evening snack, White dhokla, Beets Dhokla and now Handvo pops. I have already made Handvo by soaking grains and grinding them. So , when vaishali sent me readymade flour, i thought of doing something different with them. Apparently these dishes are so versatile, you can make so many different varieties with the same flour base. I m going to make myself some readymade flour-mixes and try other varieties pretty soon. Handvo pops, is nothing but, handvo made in appe pan. They consume very less oil, just 2 tsp for 11 pops. I have added carrots and cabbage to this flour, you can add some lauki, peas or some finely shredded zucchini also. 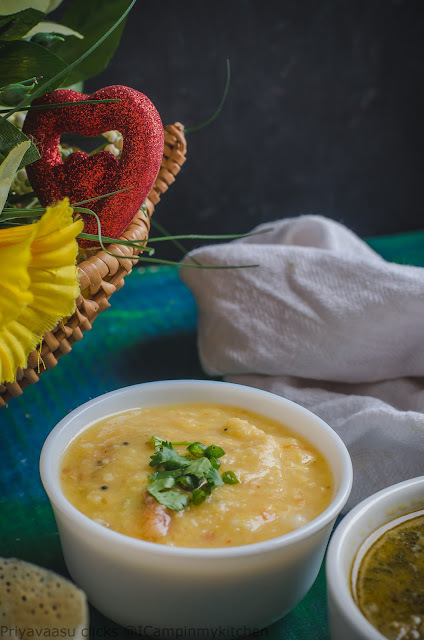 It is a complete meal with rice, dal and veggies made attractive. Both my kiddo's enjoyed their snack with some sauce and chutney. I even served this as dinner for my dear hubby. Do try i t and let me know how you liked it!! Take the handvo flour in a large bowl. Add butter milk and water to the flour and mix it well. It will be a thick batter. Let it sit overnight of atleast 6-8 hours to ferment. I made the batter around 7 in the morning and made the handvo around 5 in the evening for my kiddo's snack. After the said time, take the ingredients given under 'To Grind' and grind to a fine paste and add it to the handvo batter and give it a good stir. Add grated carrots, shredded cabbage, roasted white sesaem seeds and salt to this and mix it well. The batter will be thick, but pourable. If you find the batter too thick, add another 1/4 cup of water to it and mix well. I made the handvo in the appe pan, you can make it like a pancake too. Heat the appe pan, divide 1 tsp of amongst the pan holes. 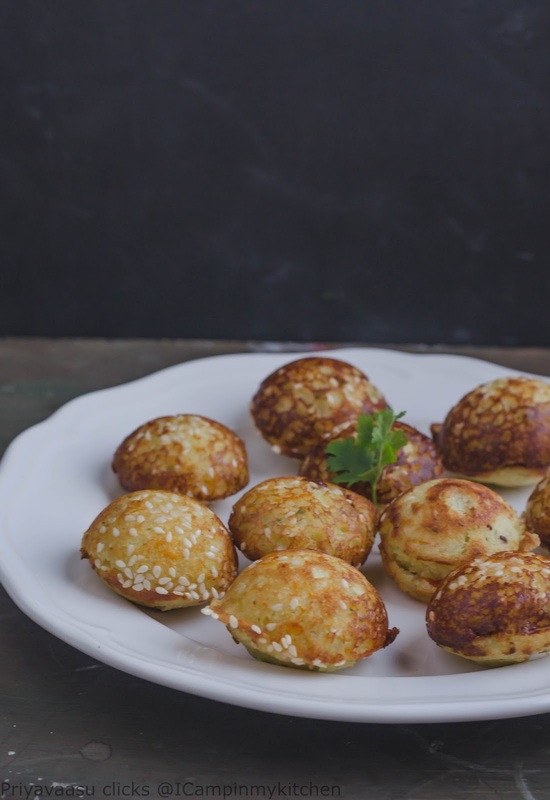 add 2 pinches of sesame seeds to each hole and our 1-2 tsp of batter into each hole. Reduce the flame to simmer, cover it with a lid and let it cook for a minute or 2 in a simmer flame. Do not be tempted to increase the flame, that will burn the handvo and leave it uncooked in the center. Once it is cooked at the bottom, using a pick or a fork, gently turn it to the other side, spread 1 tsp of oil on them. Let it cook for another minute in simmer flame. 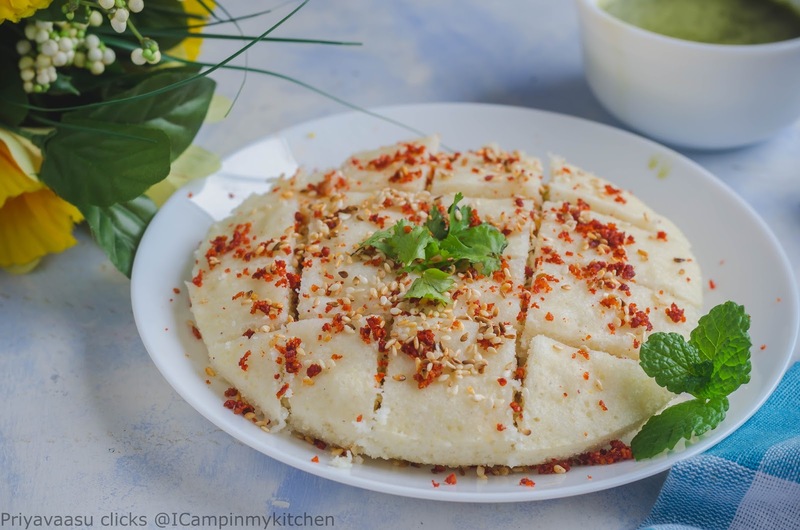 Remove the handvo pops on to a serving plate and serve it warm with chutney of your choice. I served it with coriander chutney. Take all the ingredients in a mixer and grind it together to make fine chutney. Transfer it to a serving bowl. 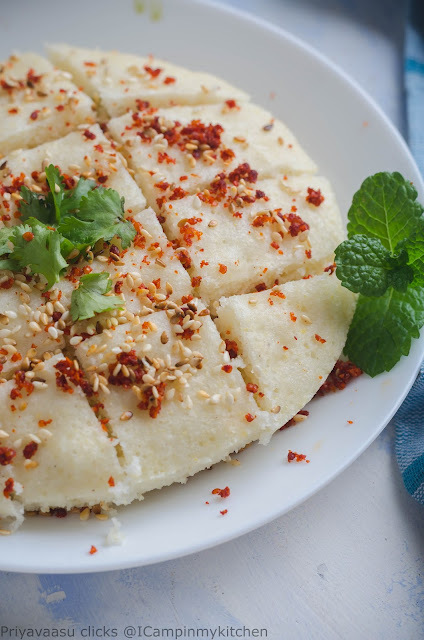 Dhokla is a vegetarian food, made using fermented batter of rice and lentils. 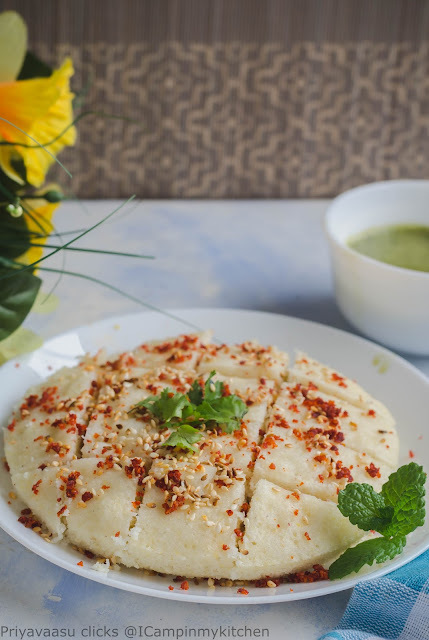 The flour mix is fermented with curd/buttermilk overnight and in the morning it is steam cooked and served with a yumm tempering of white sesame and pickle masala garnish. The second ingredient, as part of ingredients thru mail theme is yellow dhokla flour. Though it looks like flour, it is not a fine flour, you can feel coarse lentil in it. 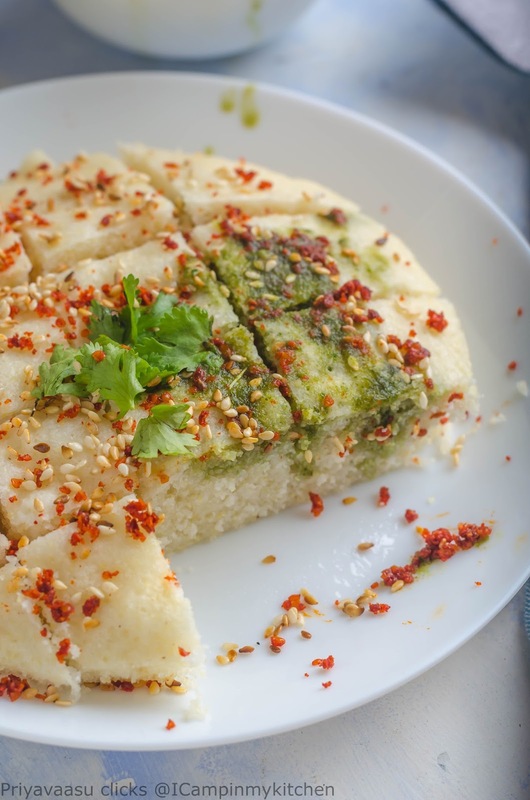 I already have khaman dhokla in my blog, and also spinach, peas dhokla. 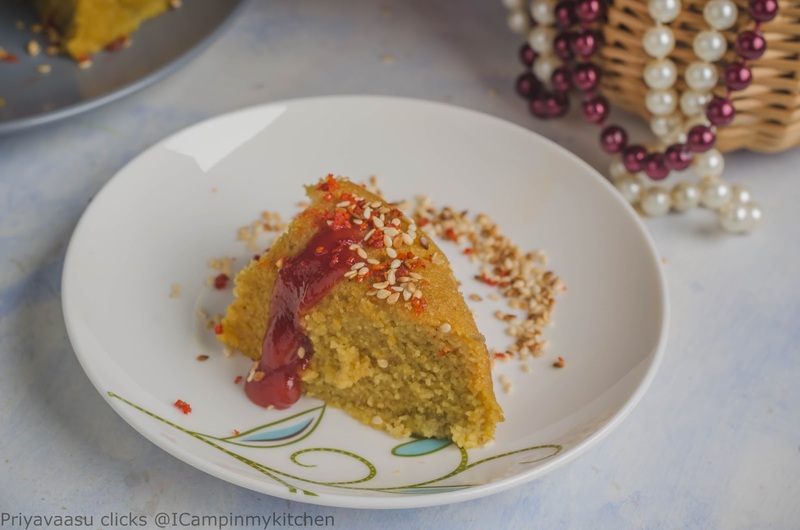 I wanted to make a vegetable dhokla, since i had some beets puree in my refrigerator, i decided to use it in the dhokla. When i added it to the flour, it had a bright pink hue, but then after steaming it lost that bright color, may be i should have gone ahead and added little more. But the taste was spot on, dont miss 2 green chillies or else you might find the beets flavor dominating, which some might not prefer. Here is another easy to make snack for day 2. Take the dhokla flour in a large bowl, mix with butter milk and water. Stir well and let this rest for 4-5 hours on the kitchen counter. If planning for evening snack, mix it and set aside by morning 10. So, it will easy for you to make it around 4 or 5. Just before making the dhokla, add the beetroot puree, salt and minced green chili and ginger. Give it a good stir, check the consistency,it should be of pouring consistency. 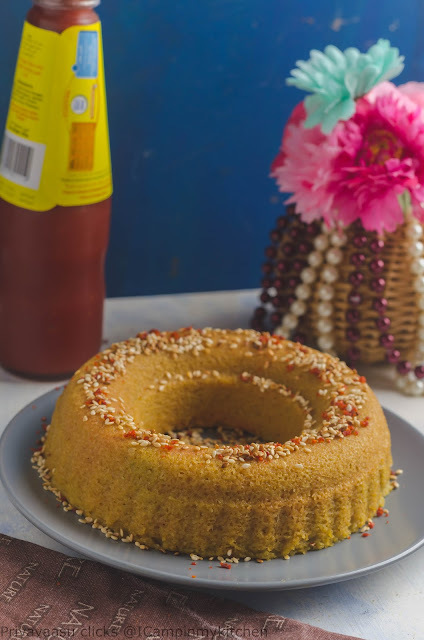 I used my small bundt cake pan, for steaming this dhokla, you can use muffin moulds or just small thali plates for steaming them. Pour the batter in the greased pan, steam cook for around 10-15 minutes or until done, A tooth pick inserted in the middle should come out clean, that is the check for done-ness. Once done, wait for 10 minutes for it cool, loosen the sides with a blunt knife and invert it onto a serving plate. Garnish with roasted sesame seeds and methia masala. Serve it warm with chutney or any sauce of your choice. I served it tomato sauce. The last week of BM, valli gave us an interesting theme - Ingredients thru mail. Valli paired 2 bloggers and we need exchange 1 or 3 main ingredients amongst us and we need to cook something interesting from those ingredients. Sounds easy na, now comes the twist, we should not tell what ingredients we are sending. Why, what is so tough? 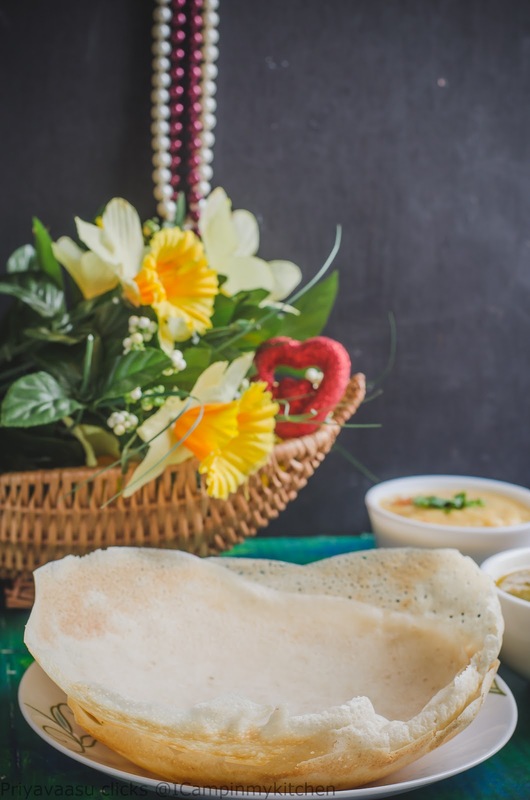 you might ask, if it is something which we use regularly like rice/pulses/cereals it is ok. What if it is a flour or some ingredient which we have never cooked or even seen? There it becomes interesting!!! For this theme i was paired with +Vaishali Sabnani. 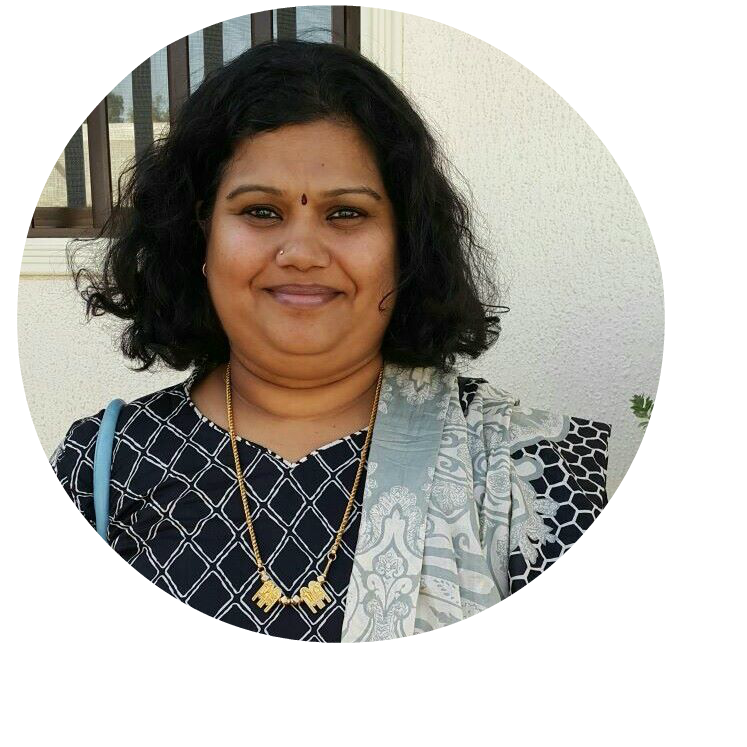 She is in India and i m here, thank god, we both had somebody travelling to our respective places, so it was easy to send the package through them. I sent her Tricolor Quinoa, freekah and Kodo Millet. She made 3 delicious recipes, quinoa salad, Kodomillet idly and a salad with freekah. She sent me a packet, with methia masala, beautiful stencil,chopsticks and 3 packets of coarse-looking flours. I was able to identity methia masala immeidately, but couldn't identify the flours. I could taste rice in them, nothing else😟. Finally Vaishali helped me to identify them. It was fun, receiving the packets, being a kid again and guessing what ingredient it would be, it was great fun!! The first recipe with her ingredients is this yummilicious safed dhokla/white dhokla. It is super easy to make with readymade flour. just mix and keep in the morning, let it sit till late inthe afternoon, make it for evening snack. Take flour, butter milk and water in a big bowl. Mix well to make a thick batter and let this sit for 4-5 hours on the kitchen counter to ferment. After the said, add ginger and green chili paste, salt and give it a good stir. Add baking soda and stir well. I used 2 small round thali/plates to steam the dhokla, it can be done in idly plates, silicon moulds or any shape of your choice. Grease the plates well, divide the batter amongst the two thali;s and steam cook for 10-15 minutes in a medium flame. When a tooth-pick inserted inthe center comes out clean,it is done. Remove from the steamer, unmould it on to a serving plate, sprinkle methia masala, roasted sesame seeds and fresh coriander on top. 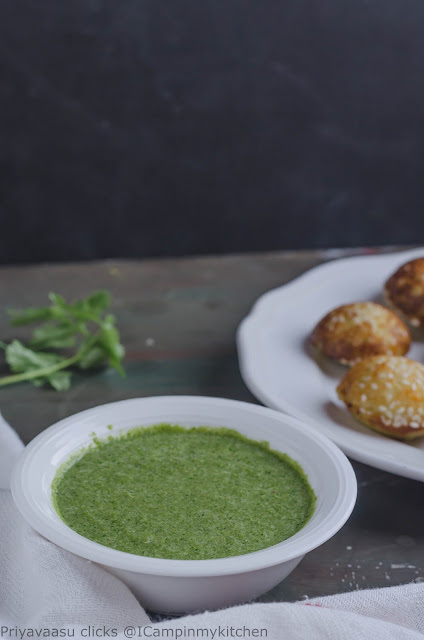 Serve it warm along with green chutney for a yummilicious snack! 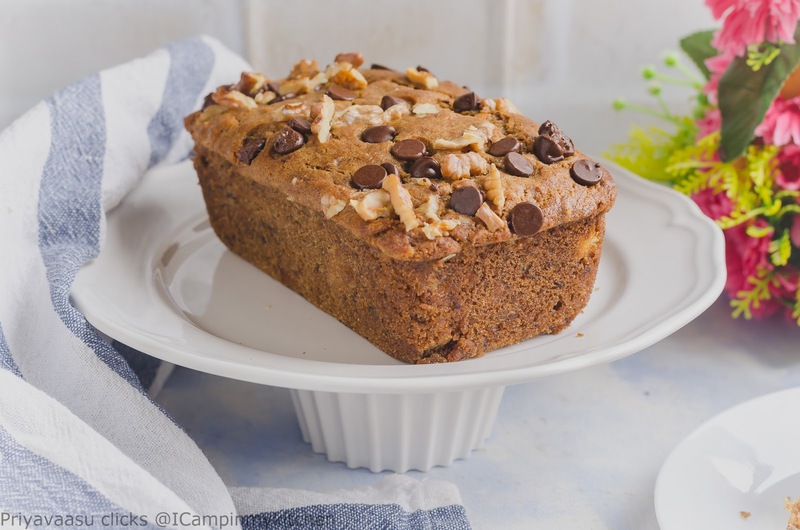 Banana bread, there must be some 100 + recipes on the web for this loaf of deliciousness! 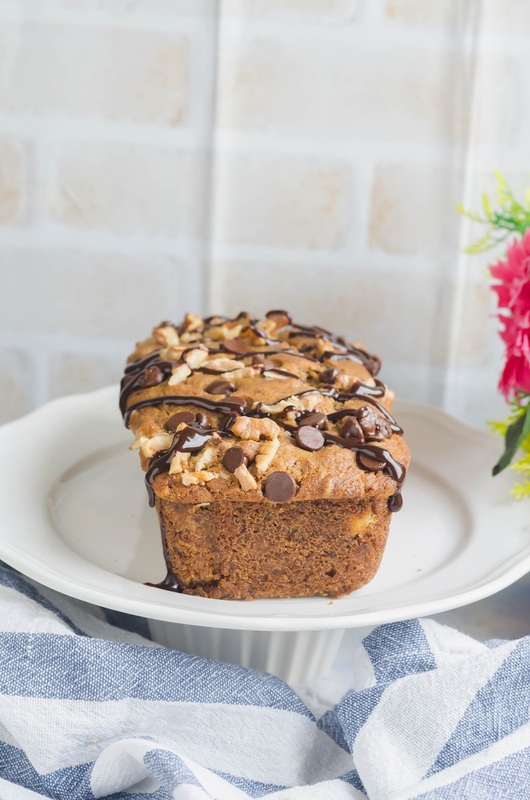 Every passionate baker will have their own recipe of banana bread, yes me too have one. I just keep experimenting with my base recipe to get a different taste every time. Like this one, i tried to surprise my kiddos with a yumm cream cheese in the center of this loaf i baked today. 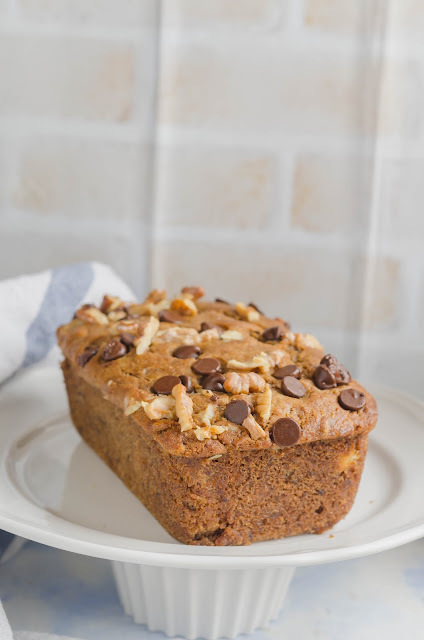 We love banana breads, there will be a loaf for my boys to enjoy during their weekend. Sometimes, we wantedly leave a banana to over-ripe, so i can make banana bread for the weekend. I spiced the bread with cinnamon, you can use vanilla instead. Whatever spice it is , the aroma of banana bread in your oven, just fills the entire house. Kids come floating in air to the kitche, just like jerry mouse swifting mozzarella cheese. I have used brown sugar, so the loaf has turned like a chocolate loaf, if you want a chocolate loaf, try replacing buckwheat flour with cocoa. Since both the flours are dense, do not skip sifting, helps in aerating the flour-mix for a fluffy loaf. Ok, enough of the banter, lets get to the recipe. Preheat the Oven to 180C. Grease two mini loaf tins with oil. Whisk together cream cheese, vanilla extract and powdered sugar until fluffy and keep aside until use. Take the banana's in a large bowl, and mash it well with a fork. To this mashed banana add brown sugar and mix well. Take both the flour in a flour-sifter, i used my Ikea flour sifter, Add baking powder and baking soda and cinnamon powder. Sift it directly into the banana-sugar bowl. In a measuring cup, take milk and oil and mix well. Add this liquid to the flour-banana mix and using a spatuala combine everything together. Do it gently, in one direction, this ensures the air is well incorporated and the loaf turns fluffy. 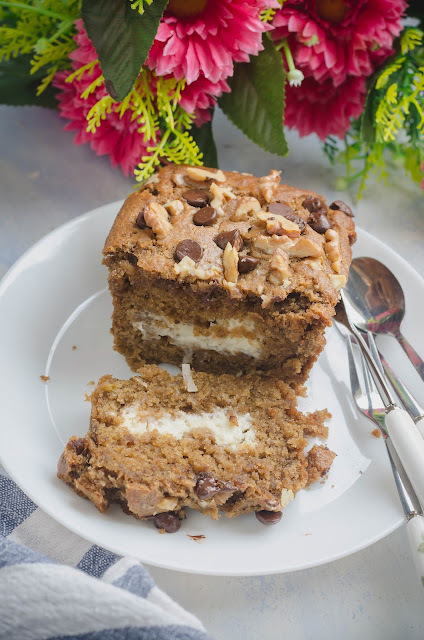 Fill half the loaf tins with the batter and add 2 ice-cream scoops of cream cheese into the loaf tins on top of the banana bread batter. spread it in the center with a spatula, do not stir. Divide the remaining batter on top of the loaf tins, covering the cream cheese. Gently tap the loaf tins to release any trapped air. Sprinkle chopped walnuts and chocolate chips on top. Bake the loaves for about 45 minutes or until done. It was done at 45 minutes for me. Oven temperatures differ from oven to oven. so please check the loaves after 40 minutes. If a toothpick inserted in the center comes out clean, it is done. Remove the loaf tins onto a wire rack, let it sit for 10 minutes. Slowly release the edges with a blunt knife and invert the loaves onto the wire-rack. Let it sit for another 10 minutes and become warm. Slice and enjoy. My boys enjoyed with a drizzle of chocolate sauce on top. I had 3 choices for today's sweet treat. I was stuck between snickerdoodle mug cake, Brown butter & banana milk shake, and a burfi out of milk powder and rose syrup. After much dilema, i decided to do snickderdoodle and this milk powder burfi. 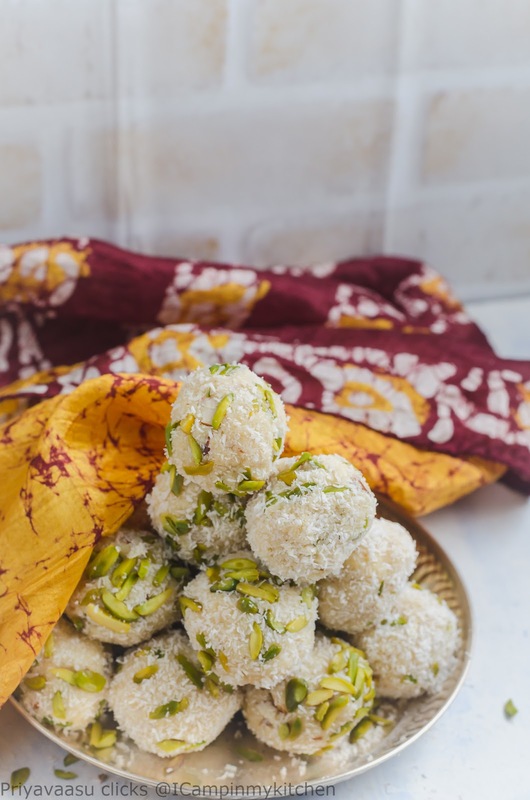 When i made the burfi, somehow i felt it won't set in the given time, so it was a last minute decision to make it as ladoo. The aroma of homemade rose syrup in this treat is so mesmerizing. 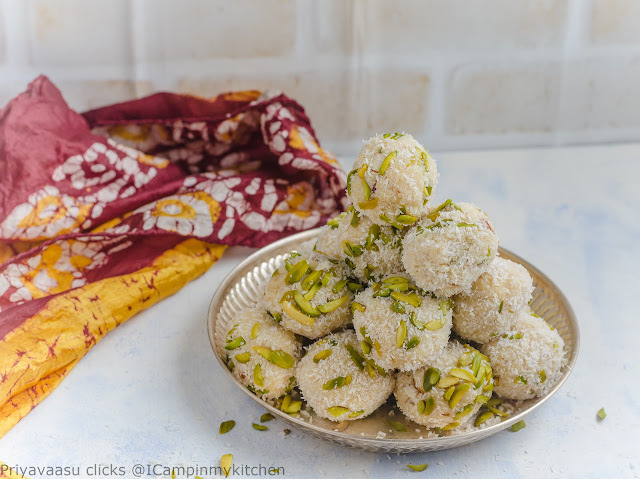 The final product tastes equal to mawa ladoo. A quickie treat, that is so rich. 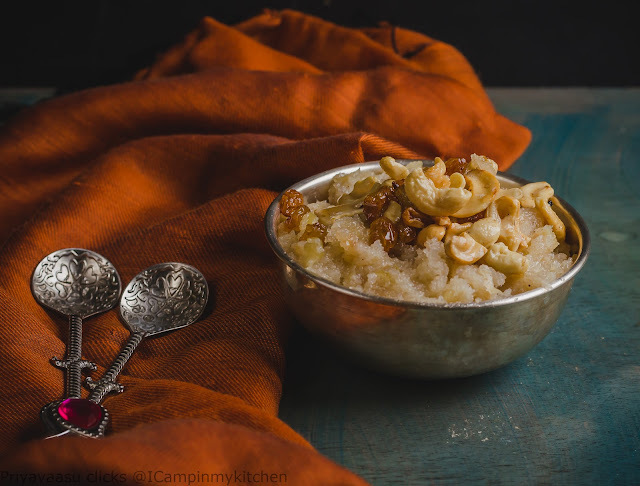 Do not miss the coconut garnish with nuts, it adds a royal touch to the dessert. 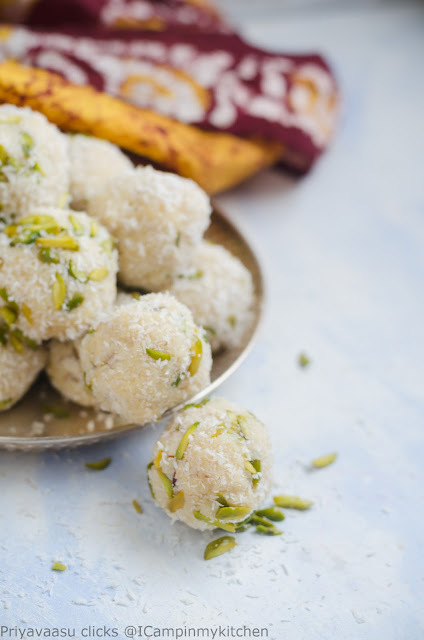 A perfect treat to gift your friends who love home-made sweet treats. In a non-stick pan, add butter. Once it melts, add milk and milk powder and stir well to get a uniform liquid. To this add coconut powder, sugar and rose syrup. Keep the flame simmer and keep stirring, do not be tempted to increase the flame, the liquid will start thickening. In about 15 minutes, the liquid will be fully absorbed and the dough will come together a big mass. Remove it from the flame. 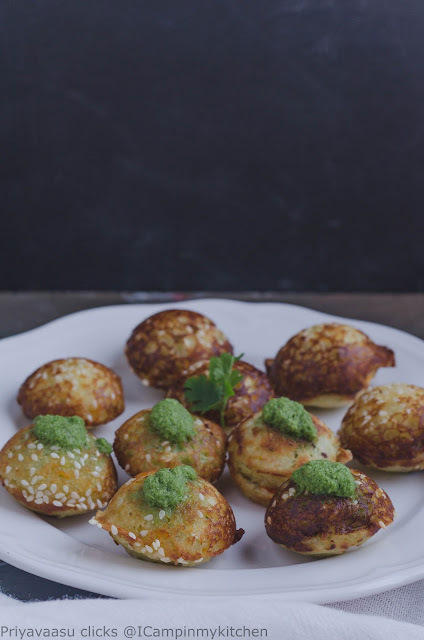 Pinch ping-pong sized balls of the dough, roll it on the coconut and pistachio garnish. Repeat the same with rest of the dough. 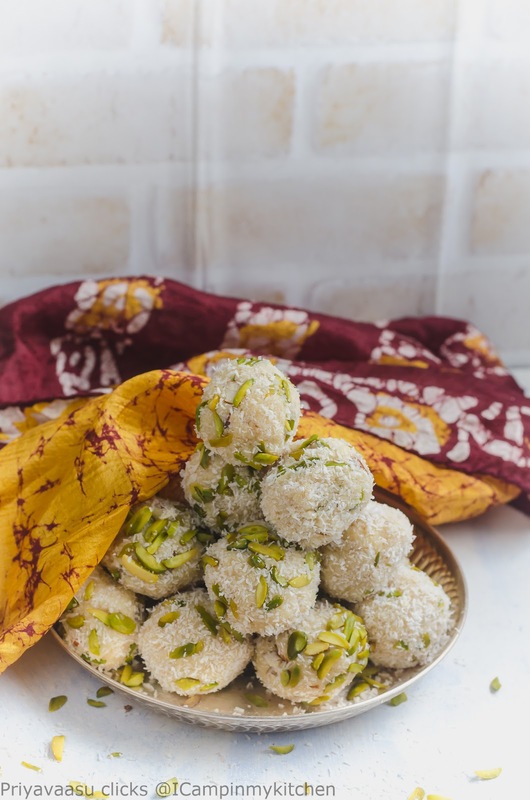 Store the ladoos in an air-tight container in the fridge. Since it is made of milk and milk powder, refrigeration will increase its shelf life. I would recommend a shelf life of 3-5 days in the fridge. The weather here is amazing from last week. Weekend it was a bit sandy and dusty, but then by evening it settled down. It was drizzling a bit and cold wind blowing all over your face. With such a climate, you just want to huddle yourself inside a blanket and enjoy a warm dessert. With a theme of 1 hour sweet treats, i m spoiled with lot of choices and was completely lost on what to choose and what to leave. Sift together flour, baking powder, salt, cocoa powder. To this sifted flour mix, add brown sugar , coffee powder and mix well. In a measuring cup, take milk, vanilla extract and add oil to it and mix. Add this liquid to the flour mix and using a spatula and mix. Mix it in the same direction and be gentle. 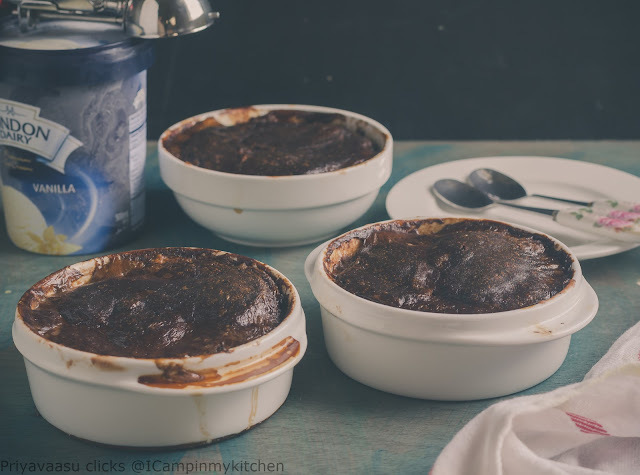 I have used 3 small bowls to bake the pudding, you can either bake it a square brownie pan or as individual servings in ramekins. 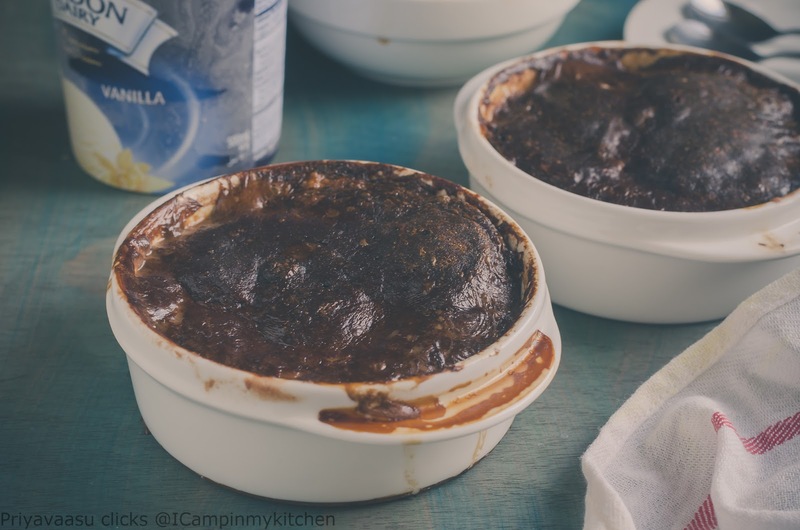 If using ramekins you might need 6-8 ramekins. Grease the baking bowls with oil/butter and divide the batter amongst the baking bowls. Fill the batter only up to half. You will be adding boiling water on top for the sauce. So do not fill the batter till the rim. To the boiling water, add coffee powder and divide the liquid amongst pudding bowls, do not stir. 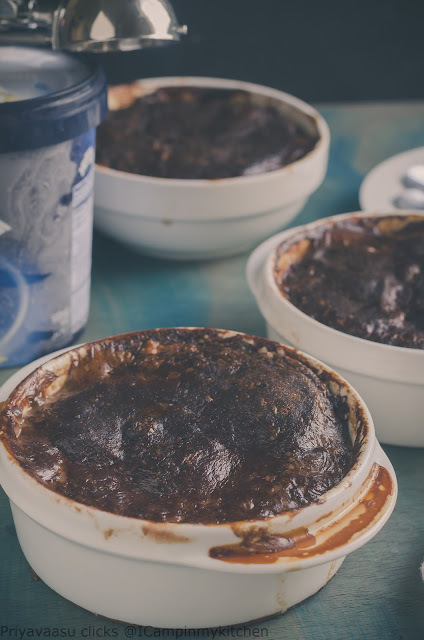 Bake the pudding for 25-28 minutes. Remove it from the oven. Serve it warm with Vanilla ice-cream on top. 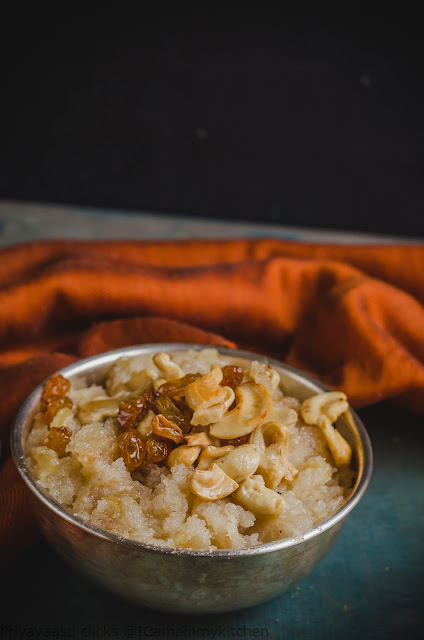 Kesari, one of easiest desserts made in Indian kitchens :). 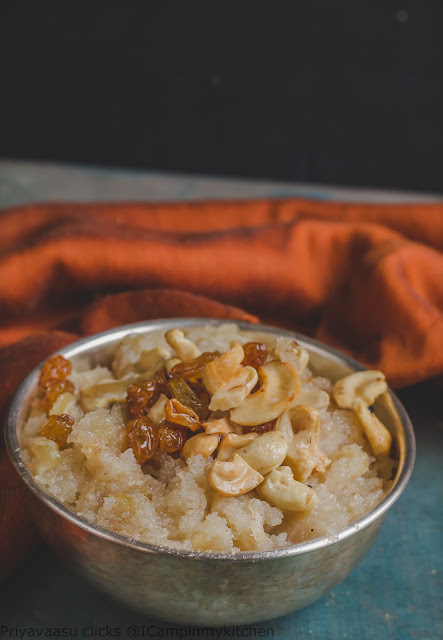 You have some sudden guests, some pooja at home, or simply you wanted to have something sweet, kesari comes to rescue. It takes less than 30 minutes to make and it is so versatile. I even thought of making 3 different types of kesari for all 3 days of the theme. The general proportion for getting this right is 1:2:3, for a cup of sooji/rava, 2 cups of sugar and 3 cups of liquid. Enusre the liquid is warm when you add it to the sooji, so there will be no lumps. 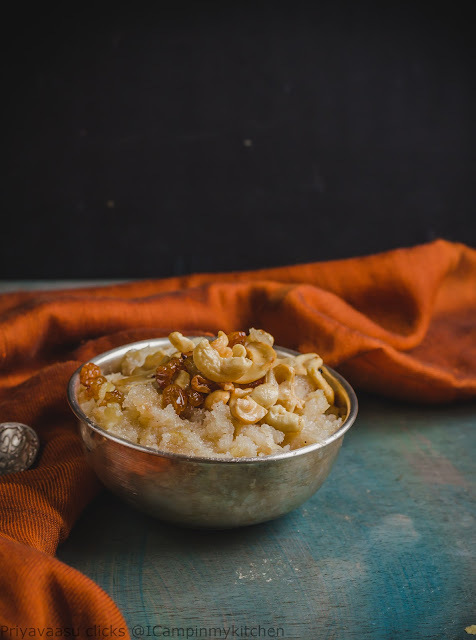 For today, i m bringing you the simple kesari with apples. Usually cardamom or Saffron is added to flavor this dessert. But since, i m using apples here, i have used Cinnamon, the best paired spice with Apples. 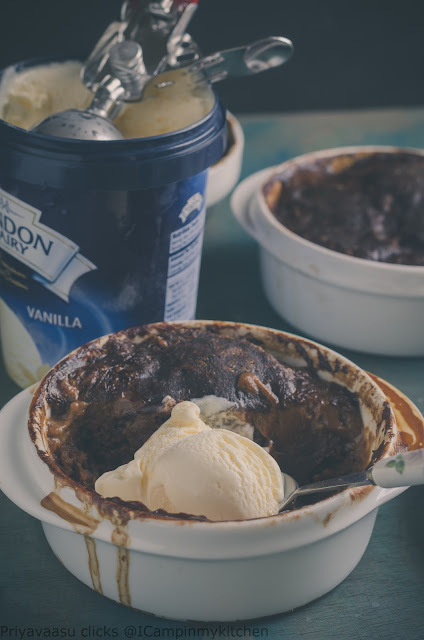 The mild flavor of cinnamom, along with apples, takes this dessert to another level. In a non-stick pan, dry roast the rava/sooji in a simmer flame, until it is golden brown.Even if you are using pre-roasted rava, do not skip this step. Transfer the roasted rava onto a clean plate. In the same pan, add 3 tbsp of ghee, add the grated apples, cloves and cinnamon and saute for 5 minutes, until apples release a nice aroma. To this now add the roasted rava and saute for 2 minutes. Now add the warm milk and water to this and mix well. Keep stirring as you add the sooji, to avoid lumps. Do not worry, if you get lumps, just take your potato masher and mash it well. Keep the flame simmer. Let the rava cook well. As it cooks, it will absorb all the liquid. So keep the flame simmer and stir frequently or else it might burn at the bottom. It might take around 10-15 minutes for the rava cook soft. Once the rava is cooked, add sugar to this. When sugar is added, the kesari/sheera might liquify a bit, do not worry, it will get absorbed. Now add the remaining 3 tbsp ghee, once tbsp at time and mix well.Once all the liquid is absorbed and the kesari follows the ladle as you mix, it is done. Take it off the stove. Garnish it with roasted cashewnuts and raisins, serve warm and enjoy this flavorsome dessert. 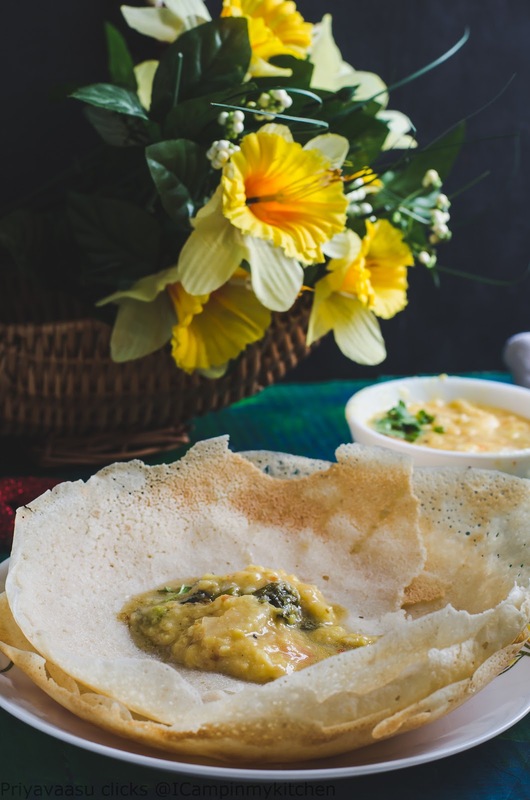 Hoppers, when i first heard the name, i thought it to be a dish with bugs!😳 Thank God to my interest in Cooking shows, i happened to see Peter Kuruvita's My SriLanka. There he showed how to make hoppers, a bowl/boat shaped pan-cake, something very similar to our Indian Aappam. When i saw the theme for Bread Baker's as Pancakes from around the world, i immediately decided to do Hoppers. 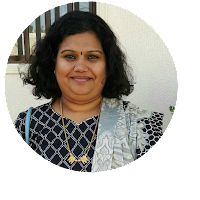 Thanks to Mayuri Patel, our host for this month, for giving us a such a vast and lovely theme! 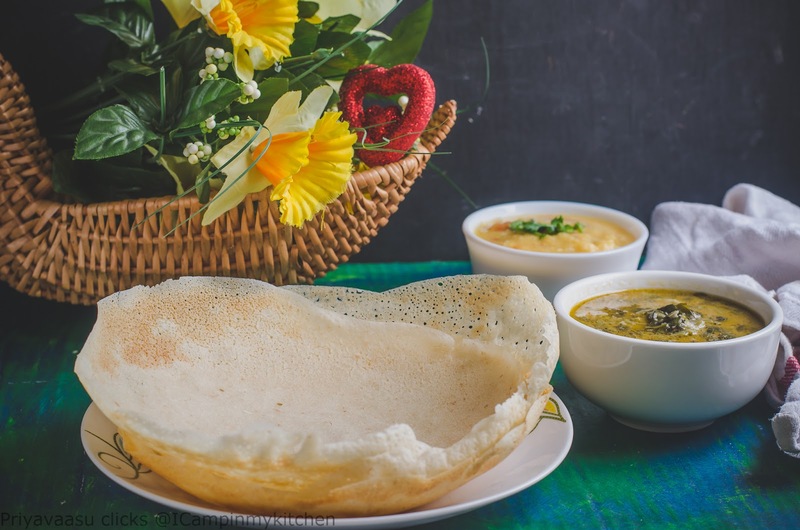 Kerala Aappam, is made by soaking rice, grinding and fermenting it. There to we add coconut milk and yeast or baking soda. But here in this recipe, it is entirely coconut milk, just coconut milk. The hoppers comes out so crispy, you can make them soft too. The trick is to get the batter right, it shouldn't be too thick, or else the batter wouldn't spread. The batter has to be swirled around in the pan, so it has to be of the correct consistency to spread when you swirl. Since the hoppers are sort of mild, you need a spicy curry to pair with it. If you eat meat, you will relish it with some spicy non-veg curry. 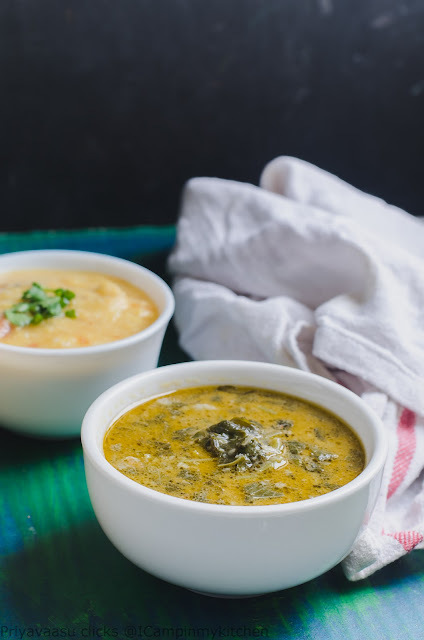 I served it with a spicy dal and a mildly spiced spinach in coconut milk gravy. 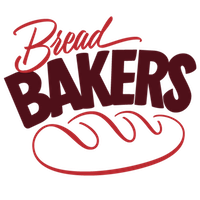 Tear the bread slice into small pieces, take them in a mixer and pulse it to powder. 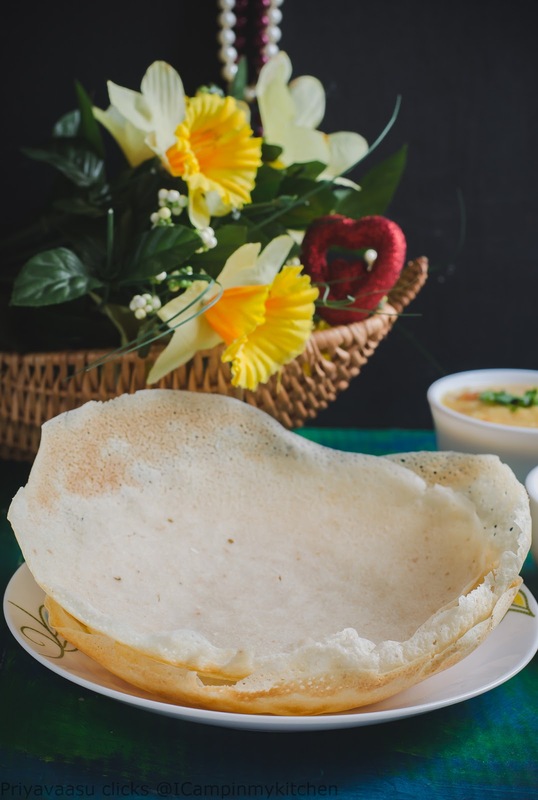 Take rice flour, bread flour, baking powder in a large bowl. Whisk well to combine. Add thin coconut milk to this mixture and mix well to make a thick batter. Let this batter rest overnight or a minimum of 6 hours. After the said time, add the thick coconut milk to the batter along with salt and mix to combine. Add water and bring it to a batter of pour-able consistency. The batter shouldn't be too thick or too thin. Heat a hoppers pan, keep the flame medium. Add a ladle of batter to the pan and swirl the pan, to spread the batter to the walls of the pan. Cover and cook the hopper. It will take around 2-4 minutes for it cook well.Remove the hopper from the pan, serve it warm along with a spicy curry. 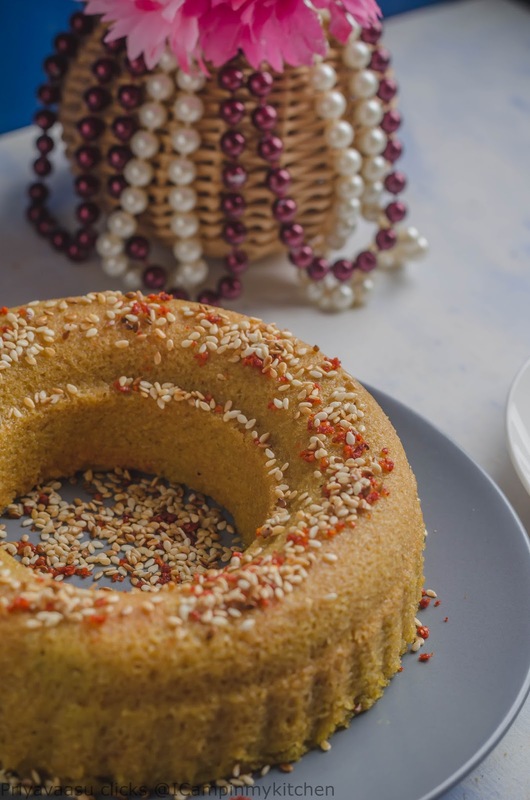 There are some recipes, which you want to try immediately. Original plan for today was to bake some Vegan Jaffa Cakes. FB sometimes,causes so much chaos in our day-to-day plan, as i was browsing idly through other people statuses, this video, dannggg sprouted on the screen. 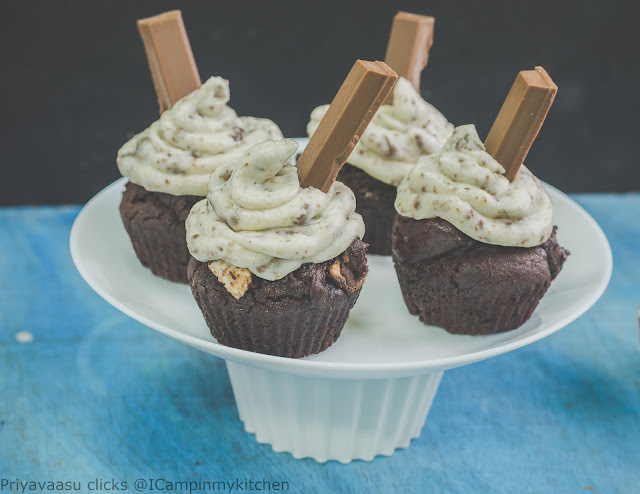 Tasty Video on how to make Kit-Kat cupcakes, i sprang up on my feet, and ran into the kitchen and made these immediately.I waited for them to cool and frosted them too, which in my case is a rareity! These cupcakes are a complete sell-off with kids, the moment in comes on the table, i m sure they will vanish, mine is down to half now, i saved a few for tomorrow's snack! 2 kit-kat wafers, crushed, resembling coffee granules. Preheat the oven to 180C. 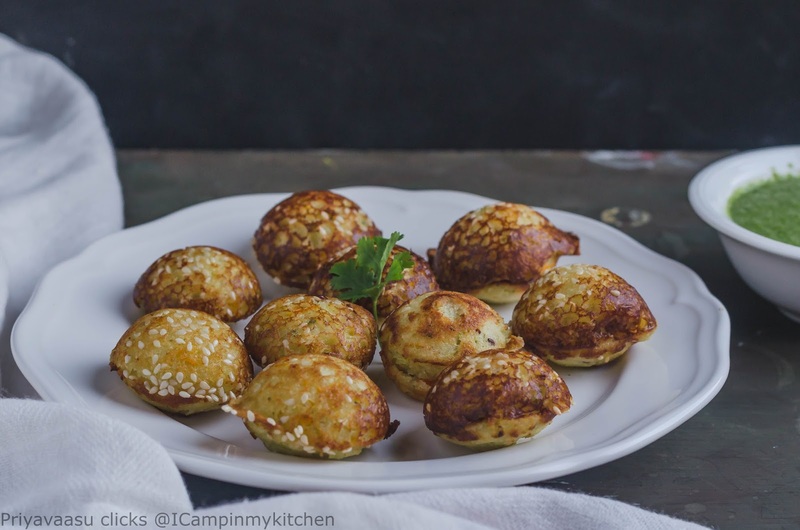 Keep a muffin-tin greased or lined with muffin-liners. I used silicon muffin moulds. Sift together whole wheat flour, cocoa, baking powder, and baking soda together in a big bowl. 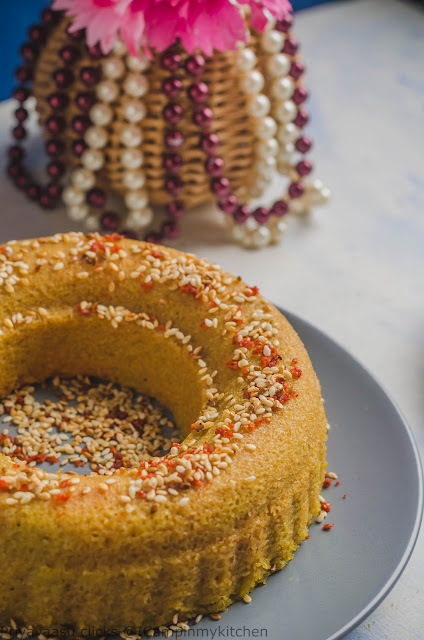 Sifting is more important, it makes the flour light, that helps in the texture of the cake. Add the broken kit-kat pieces to this flour mix and mix well. In another cup, mix together milk and oil. Add the milk-oil mixture to the flour mix and slowly combine well with a spatula. Combine in one single direction, and be gentle. Scoop the cake batter with an ice-cream scoop and fill the muffin moulds upto 2/3 of its capacity. Bake the muffins in the preheated oven for 22-25 minutes or until done. to check the done-ness, a tooth pick inserted int he center of the muffin, should come out clean. Remove the muffins on to a wire tray and let it cool completely. Whisk together cream cheese, sugar and vanilla extract until light and fluffy. To this add the crushed kit-kat and mix. Drizzle 1 tsp of sugar syrup on each of the muffin prior to frosting. Take the prepared frosting in a piping bag, i didn't use any nozzle, i just sniped the bag-end and piped. 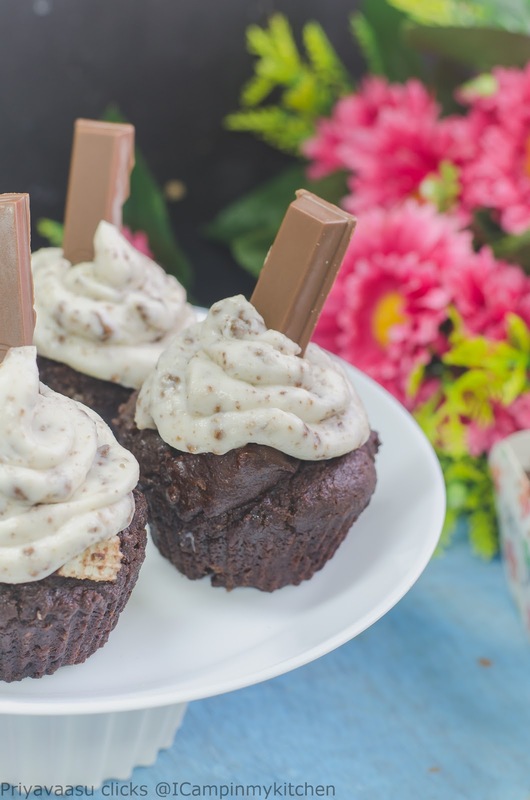 If you prefer, use any piping nozzle of your choice to dress up the muffin. If doing like mine, take the frosting in a ready-made piping bag, snip off the end, pipe swirls on the muffin. Garnish it with half a kit-kat wafer and serve. I added only 1/2 cup sugar while baking, thinking the kit-kat will add more sweetness to the muffins. But no, so please do not reduce the sugar. That is why i added some sugar syrup while frosting. Coconut macaroons, were in my to-do list for a long time. 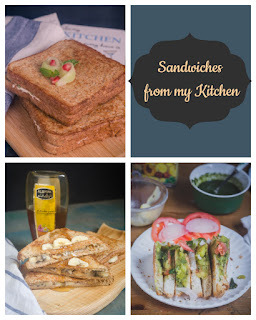 Being a food blogger, my favorites and bookmark folders are always overflowing, whenever i see a good recipe, i bookmark it immediately. That too if it is bake recipe, i bookmark with egg, without egg, vegan every good bake. 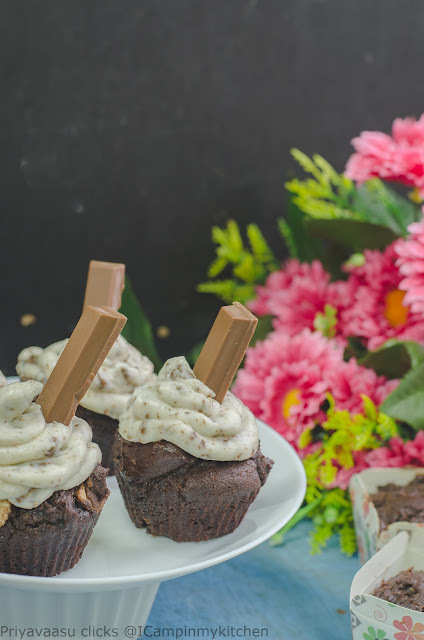 For the second week of BM, i chose Kids delight - mini bakes as my theme. Before deciding on the recipes, i checked my Bookmark folder and picked 3 recipes. First one, is this simple and easy coconut macaroons. The recipe is so simple, even a kid can bake it. It is just mixing of ingredients and shaping it. 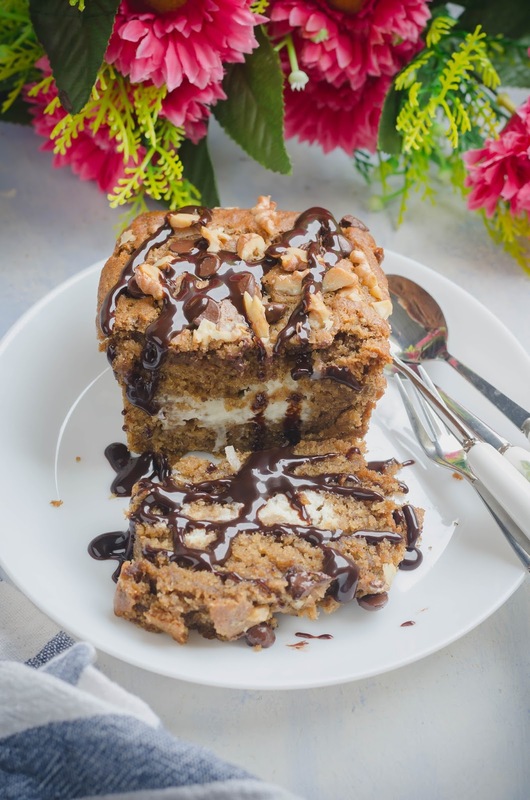 The original recipe used just coconut and condensed milk. I have added tutti-frutti to the dough and garnished it pistachios. The cookies have a crusty bottom and a soft chewy texture. This recipe gives a dozen cookies. You can double or halve the recipe according to the number of cookies needed. Now coming to the photos, all are taken with iphone, since we had a family get-together at my BIL's house and had to leave very early. So, i hurriedly clicked using my iphone and left. Will try to take them again with my camera and update as soon as possible. Take condensed milk in a wide bowl, add coconut, tutti-frutti, vanilla extract/powder to it. Mix well with a spatula. 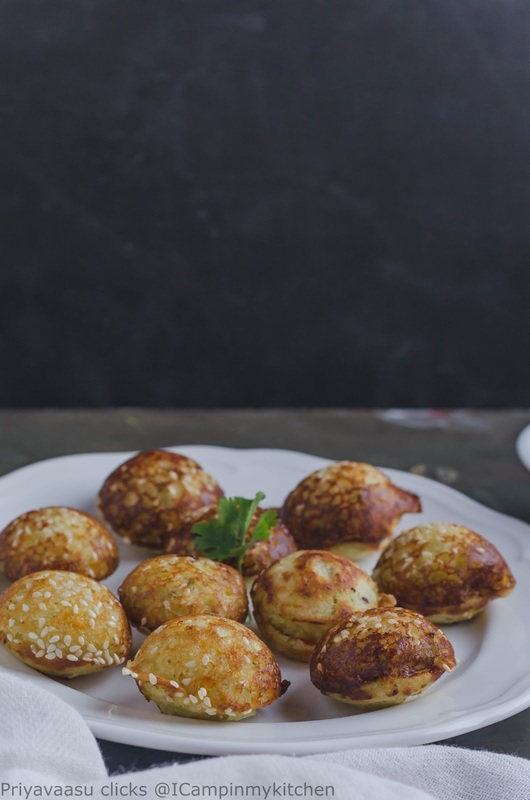 Grease your hand with some oil/ghee/coconut oil, pinch ping-pong sized balls out of the cookie dough and flatten them into thick discs. Touch the top of the shaped cookies with some pistachios. Place the cookies on a parchment-laid baking tray and bake the cookies 🍪 for about 18-20 minutes or until golden brown.